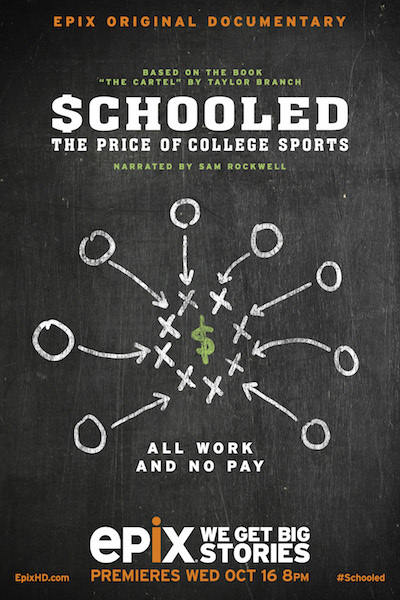 Schooled: The Price of College Sports is a comprehensive look at the business, history and culture of big-time college football and basketball in America. It is an adaptation of “The Cartel” by Pulitzer Prize Winning civil rights scholar Taylor Branch, and his October 2011 article in The Atlantic, “The Shame of College Sports.” Schooled presents a hard-hitting examination of the NCAA’s treatment of its athletes and amateurism in collegiate athletics; weaving interviews, archival and verité footage to tell a story of how college sports became a billion dollar industry built on the backs of athletes who are deprived of numerous rights. Those interviewed for the 80-minute documentary include current and former college athletes, coaches, academic advisors, NCAA compliance officers, historians, sports journalists and university administrators, such as: Houston Texans’ running back Arian Foster, Emmy-winning Sportscaster Bob Costas, ESPN analyst Jay Bilas, Joe Nocera of The New York Times, Dave Zirin of The Nation, Sports Illustrated’s Frank Deford, George Dohrmann, BJ Schecter and Michael Rosenberg. The documentary, a Makuhari Media Production in Association with The Slater Group, is directed by Ross Finkel, Jon Paley and Trevor Martin (directors of Ballplayer: Pelotero); executive produced by Bobby Valentine; produced by Andrew J. Muscato, Taylor Branch, and former college and NFL player Domonique Foxworth.